Gardens by Altit Fort, Altit, Pakistan. Laying stone floor, Khaplu, Pakistan. 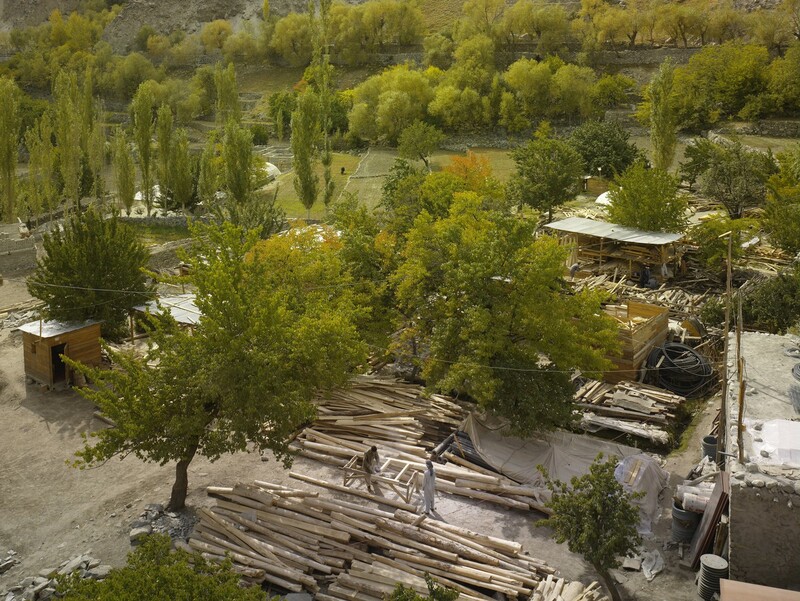 Lumber yard, overview, Khaplu, Pakistan. The high mountain valleys of Gilgit-Baltistan, which were once a part of the old Central Asian Silk Route, were inaccessible to vehicular traffic until the construction of the Karakoram Highway in 1978. Increased accessibility, coupled with the impact of tourism, introduced a rapid transformation of local customs and economic patterns, which called for new strategic development visions and adapted procedures capable of steering ongoing rapid change. Residência do Forte de Shigar, rio e entrada, Shigar, Paquistão. The conservation of the over 700-years-old Baltit Fort – the pre-eminent landmark monument in Gilgit-Baltistan – and the rehabilitation of the historic core of the Karimabad village in the Hunza Valley, were the Aga Khan Historic Cities Programme (AKHCP’s) first major interventions. The projects were completed in 1996. It was clear from this experience that meaningful restoration works needed to be associated with the ongoing rehabilitation of traditional settlements as well as the promotion of building techniques. Projects in Hunza and Baltistan have included the restoration of several other historic forts and former palaces, as well as other culturally relevant landmark buildings. The forts in Baltit and Altit in Hunza are local history museums and cultural centres, while Shigar Fort and Khaplu Palace Residence in Baltistan both serve as small hotels offering authentic heritage experiences for visitors and generate employment and various other benefits for the local communities. A recent project includes the 90-year-old Vazir House in Swat, which has been converted into a heritage guesthouse. In Altit, the Leif Larsen Music Centre has been established to facilitate local musicians and to document the musical traditions of Hunza and its neighbouring valleys. This initiative is part of a broader goal to promote the region’s intangible heritage – languages, folklore, music, arts and crafts, traditional performances and sports. The villages and neighbourhoods around the Forts, which were in danger of being deserted in favour of dispersed modern construction in the fields, were – and continue to be – rehabilitated through the active efforts of residents. These activities represent a new trend that not only boosts cultural pride, but also helps reduce costs for road construction and infrastructure provision, saving the precious agricultural terraces from uncontrolled construction. Preserving indigenous values and at the same time introducing contemporary living standards, including sanitation, has been the key to the ongoing cultural development process. It is important to underscore that these projects are undertaken with the active involvement of the local communities. Additionally, social enterprises are being facilitated in raising awareness about the use of traditional building practices and in promoting the use of greenwoods, such as poplar, for construction. As a means to address rural poverty and to encourage the participation of women in local economic activities, a pilot initiative was introduced in 2003 to provide women from poor households access to income generating opportunities through participation in ongoing restoration projects. Since then, Ciqam – a women’s social enterprise, has evolved into an effective vehicle to engage women in non-traditional skills such as topographic and building surveys, carpentry, hospitality and tourism. Strategic planning principles to both protect and take advantage of existing environmental and cultural assets in the light of growing tourism are now being implemented through a comprehensive tourism management plan. Partnerships with the Government of Gilgit-Baltistan as well as law enforcement agencies, hoteliers, local municipalities, community-based organisations and other AKDN agencies have been strengthened to ensure that the negative effects of tourism are mitigated in a collective and holistic manner. These projects have won a number of prestigious prizes, including the UNESCO Asia-Pacific Heritage Awards for Cultural Heritage Conservation (every year between 2002 and 2013); a Time Magazine “Best of Asia”; and a British Airways Tourism for Tomorrow Award for the restoration of Baltit Fort and Responsible Tourism Awards for Shigar and Khaplu forts. AKTC has completed dozens of other restoration projects in Gilgit-Baltistan and Chitral, but the area remains a treasure trove of shrines, forts, mosques and other buildings of cultural and historical significance. Most have fallen into ruin, but the potential still exists to use the experience provided by previous revitalisation projects to convert this legacy into viable economic assets that then lead to the creation of jobs, economic stability and an improved quality of life. Baltit Fort, after restoration by the Aga Khan Trust for Culture. Conservation projects in the Hunza Valley began with the 700-year-old Baltit Fort and eventually encompassed the traditional settlements in Karimabad. Baltit Fort was described by a visitor in 1979 as “a labyrinth of dark, smelly, dusty rooms” with decaying roofs pierced by holes and cracked walls that leaned precariously outside foundation lines. Yet it was undoubtedly a masterpiece of craftsmanship and thoroughly adapted to climate and function. Restoration work began on the Fort in 1992 and was completed in 1996. It has since become a local history museum and cultural centre. The villages and neighbourhoods around the Fort, which were in danger of being deserted in favour of new construction, have been rehabilitated with the active participation of residents. In most cases, the traditional houses have now been reoccupied. The key to this successful revitalisation effort has been the introduction of contemporary living standards, including piped water and sanitation systems. Valuable arable land once slated for construction is still under cultivation. To plan future strategies for the growth and development of the town, a Town Management Society has been set up with the assistance of the Trust. The restoration effort has won a number of awards, including a UNESCO Asia-Pacific Heritage Conservation Award for Excellence in 2004, a Time Magazine “Best of Asia”, a Pacific Asia Travel Association (PATA) Golden Globe, and a British Airways Tourism for Tomorrow Award. 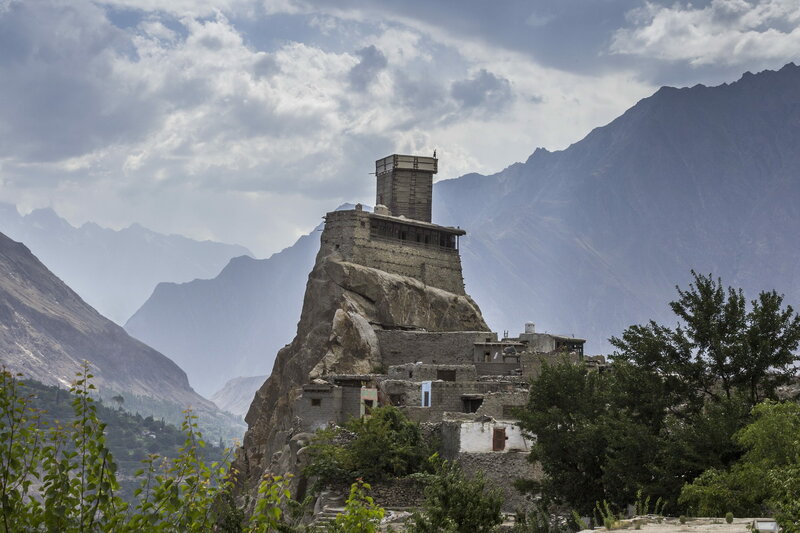 The restored 900-year-old Altit Fort in Hunza, Pakistan. Altit, a village located at the foot of the 900 year-old Altit Fort, had been partially deserted by its residents. Nearly a third of the homes had been abandoned, and new construction was using up valuable arable land. In an attempt to address this phenomenon and pre-empt the socio-economic consequences expected from a tourism boom, conservation efforts at Altit proceeded in reverse order: the village rehabilitation before the Fort. As in Karimabad, the introduction of water and sanitation facilities has proven vital to the revitalisation of the traditional settlement. The conservation strategy for Altit Fort developed in 2004 called for preservation “as found”, that is, basically as an empty shell, showing off the resilient traditional engineering techniques that have allowed for such structures to cope with tremors in a fairly active seismic zone. Most conservation works relate to mending structural defects, stabilising and repairing existing walls, replacing some roofs, treating wood decay and providing appropriate lighting. 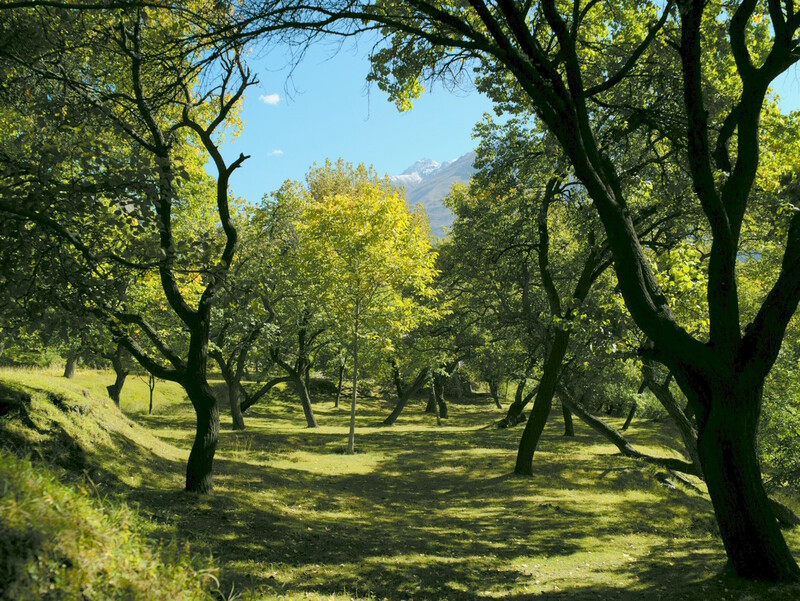 Altit Fort is open to visitors, while its splendid undulating garden – a fairy tale orchard – is a welcoming haven of tranquillity and nature. The KhaBasi Café situated in the garden re-uses the Mir’s colonial era winter residence and serves local traditional dishes. Entrance fees are charged for both the Fort and the rehabilitated historic village, with a portion going to the Altit Town Management Society, which also collects fees for sanitation and water services from the community for operation and maintenance of these services. Following its completion in 2010, Altit Fort was recognised with the UNESCO Asia-Pacific Award of Distinction in 2011. Conservation in Ganish has centred on historically important spaces such as the jataq, (a traditional communal space) used for public meetings, ceremonies and festivals. The use of this space had long been abandoned and the four exceptional mosques around the jataq were in a near state of collapse. The Trust restored the mosques and the public space using methods developed in the conservation of Baltit Fort and Karimabad. Restoration also involved the remaining towers and gates of the original fortifications. The pharee (community pond) was also rebuilt and the village guesthouse was restored. Ganish is the recipient of two UNESCO Asia-Pacific Awards for Cultural Heritage Conservation: one in 2002 for the restoration of four mosques and then in 2009 for the conservation and reuse of the Ali Gohar historic house. Shigar village and Fort, Pakistan. The restoration of the Shigar Fort and its conversion into the “Shigar Fort Residence” – now called Serena Shigar Fort (SSF) – builds on a process that began with previous efforts in the Hunza Valley. However, while it builds on these earlier efforts, it also represents a pioneering approach that stresses a more active adaptive re-use. Featuring guest rooms that highlight the heritage of the region, Shigar Fort has been managed by AKDN’s Tourism Promotion Service (TPS), since 2008, as a heritage guest house. It is meant to bring cultural and economic objectives together in a way that sustains the operations and maintenance of the Fort while providing a catalyst for economic improvement in the area. The broader development project in Shigar includes restoration of mosques and the rehabilitation of the settlements of Chinpa, Halpapa and Khlingrong, including upgrading of water and sanitation systems. The fifteenth century Amburiq Mosque was restored to demonstrate that conservation of badly damaged monuments was feasible. Amburiq, the first mosque built in Baltistan, received a UNESCO Asia Pacific Award of Merit for Cultural Heritage Conservation in 2005. The project was praised for its "sensitive conservation programme which was undertaken by the Aga Khan Cultural Service Pakistan. The building and its courtyard have now been returned to modern use as a community museum, giving renewed life to one of the region’s historically and socially significant structures". Constructed four centuries ago, Khilingrong Mosque was in an advanced state of deterioration when AKCSP began its conservation. Not only has the conservation since reinstated the religious function of the building, it has also reinvigorated an important public space for day-to-day social interactions among the community. This project won the UNESCO Award for Cultural Heritage Conservation in 2012. The impact of the conservation of the Shigar Fort has since fostered an awareness of traditional construction techniques, use of sustainable greenwood like poplar or walnut, and revived traditional crafts such as carpentry and wood carving. In 2009 AKCSP helped the community design and construct the Shigar Abruzzi School, the first purpose-built structure using traditional materials of timber and stone, and the first co-educational private school in the valley. A similar community-built project was the new Jamia Masjid Shigar, also built in a traditional style instead of the originally proposed concrete structure. Shigar Fort has won a number of awards, including a 2006 UNESCO Asia-Pacific Heritage Award of Excellence and a Pacific Asia Travel Association (PATA) Gold Award and, in 2008, the Virgin Responsible Tourism for Tomorrow Award for Best Conservation of Cultural Heritage. In Khaplu, AKTC undertook restoration and re-use of the Khaplu Palace, built in 1840, which is the finest surviving example of a royal residence in Baltistan. In 2005 when restoration work started it was in a state of considerable dilapidation. 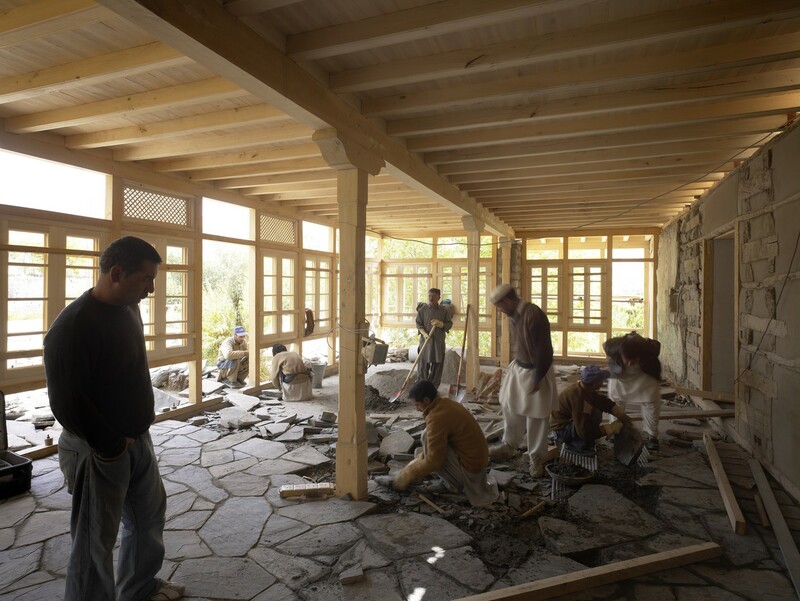 In July 2011, the restored Khaplu Palace & Residence was opened up under the Aga Khan Fund for Economic Development’s (AKFED) Tourism Promotion Services (TPS) division as a 21 room residence, similar to Shigar Fort, for high-end, discerning visitors. The Trust had earlier undertaken restoration of the historic astana (shrine and tomb) of Syed Mir Muhammad, in Khanqah settlement, as well as a number of community-development projects in Hunduli, Banpi and Doqsa, in partnership with the Khaplu Town Management and Development Society. The Trust selected the Hunduli village as the location for a demonstration project that would exhibit low-cost improvements, including social services, in individual dwellings and public spaces. These improvements were undertaken with local labour and materials (with appropriate technical assistance). The objective was to show that old homes could be re-adapted to new requirements – thereby preserving the heritage of the region – and that public spaces could be revitalised in a cost-effective manner. The project is also intended to revive traditional carpentry and construction techniques through hands-on training and to develop innovative uses of traditional materials. The astana (historic tomb) of Syed Mir Muhammad in Khanqah settlement also received a UNESCO Asia-Pacific Heritage Conservation Award for "noteworthy restoration of the 300-year old mausoleum [...] which returns an important architectural and community landmark to its former prominence in the northern Pakistan highland settlement of Khaplu. The building’s aged patina and historic character has been carefully retained through skilful and sensitive conservation techniques." Khaplu Palace is the recipient of a 2013 UNESCO Asia-Pacific Heritage Conservation Award and an earlier 2012 Virgin Airways Responsible Tourism Award. The efforts in northern Pakistan point towards the development of a number of interlinked projects in the part of Central Asia where Pakistan, Afghanistan, Tajikistan and China meet. Beyond the rehabilitation and conservation of monuments, this vision encompasses itineraries along different branches of the old Silk Road that will allow visitors to enjoy the historic built environment, to experience the exceptional natural beauty of the area and to learn about the region’s living cultures. The Silk Road initiative would help people from across the region to connect by celebrating local cultural traditions and values. By preserving the natural and physical environment and by highlighting authenticity, the Trust aims to attract visitors in manageable numbers. The role of these visitors is not only to help strengthen and sustain the local economy, but also to help safeguard the region’s unique cultures. A majority of the projects in Gilgit-Baltistan have been the beneficiaries of generous funding and ongoing support from the Government of Norway. The governments of France, Italy, Switzerland, Japan, and Germany, and of Gilgit-Baltistan, have also supported initiatives in the region. The Gilgit-Baltistan government has facilitated these activities and has taken recourse to expertise provided by AKTC.